Summary: After trained examiners and accomplished business professionals performed a thorough assessment of this work, Jim Lancasterhas been selected as a recipient of an internationally recognized award from the Shingo Institute, a program in the Jon M. Huntsman School of Business. The author will receive the award at the Shingo International Conference occurring April 9-13, 2018 in Orlando, Florida. LOGAN, Utah — The Shingo Institute, a program in the Jon M. Huntsman School of Business at Utah State University, has awarded Jim Lancaster with the Shingo Publication Award for his book, “The Work of Management: A Daily Path to Sustainable Improvement.” Lancaster is the CEO and owner of Lantech.com, LLC, the leader in stretch wrap technology and innovation. Lantech, a star of the Lean management movement in the 1990s, enjoyed success for a decade as it converted operations from wasteful batch production to efficient flow production. Its turnaround was featured in the business best-seller “Lean Thinking” and the Harvard Business Review. Lantech was an American manufacturing success story – or so it seemed. As CEO, Lancaster tried to solve two mysteries that were deepening over the years: “If we’re so good at continuous improvement, why are profits stagnant? And why do kaizen improvements deteriorate so quickly?” The answers to these two interrelated questions came after he pulled on his steel-toed boots early one morning and walked, not to his office, but into a manufacturing cell and embarked on a journey to understand the daily work of frontline operators who made the company’s stretch wrapping machines. After months of observations, experiments, and improvements, he had installed and maintained a new system of “daily management.” As a result, improvements were sustained, money from them hit the bottom line, and Lantech’s profitability quadrupled. In this book, Lancaster tells a practical and inspiring story on two levels. It’s a close-up, candid look at his personal transformation as a leader. It’s also a practical, in-depth, business case study of Lantech’s Lean transformation, relapse, and comeback that companies in every industry can use to profitably transform themselves. 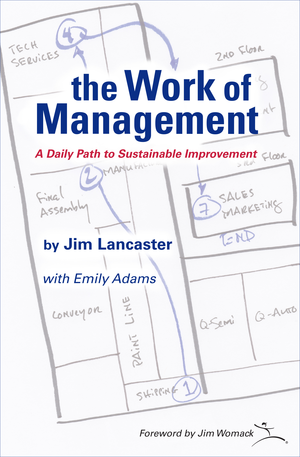 Jason Morin, a continuous improvement director at a $15 billion global logistics and transportation company says, “The story in the ‘Work of Management’ is about the re-birth of a Lean journey for Lantech… This isn’t just a book about leadership regarding an organization’s Lean journey. The reader becomes immersed in the CEO’s daily thoughts. You experience his fears, his frustrations, his challenges, and many aha! moments as Lantech slowly re-invented itself. The reader also gets the joy of seeing first-hand the humble transformation of a CEO. Lancaster will receive the award at the awards ceremony during the Shingo Conference in Orlando, Florida, USA on April 9-13, 2018.The conference is a week-long event featuring a selection of workshops, plant tours, keynote speakers and breakout sessions designed to provide ongoing knowledge, insights and experience for organizations in pursuit of operational excellence. Drawing from Dr. Shingo’s teachings and years of experience working with organizations worldwide, the Shingo Institute developed the Shingo Model™ which is the basis for its several educational offerings, including workshops, study tours and conferences. Workshops are available in multiple languages through the Institute’s licensed affiliates. For more information on workshops, affiliates, or to register to attend the International Shingo Conference, please visit www.shingo.org.